BELLFLOWER, Cal. – This week’s debut of Ray Comfort’s latest film was met with such overwhelming interest that his ministry’s website temporarily crashed as a result of the number of visitors trying to download the new movie. As previously reported, New Zealand-born evangelist Ray Comfort has released several influential films and documentaries in the past, including 180—a 2011 movie about abortion that has received several million views. His latest project, Evolution vs. God, features interviews with several well-known evolutionist professors who struggle to provide observational evidence supporting evolutionary theory. On Thursday, a pre-release version of Evolution vs. God was made available for the first time as a $19.99 MP4 download, and Comfort’s ministry’s website quickly became overloaded by the barrage of traffic. The recent onslaught of criticism aimed at Evolution vs. God leads Comfort to believe that the film is striking a cord with the evolutionist community. Meanwhile, dozens of influential Christian leaders have conversely praised Evolution vs. God, opining that it reveals the true weakness of Darwinian evolution, while strengthening the faith of the average Christian. On July 22nd, Answers in Genesis will be hosting the world premiere of Comfort’s film at their Answers Mega Conference in Sevierville, Tennessee. 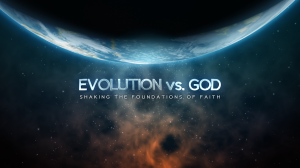 Then, on August 7th, both the DVD and YouTube versions of Evolution vs. God will be made publicly available.